If a place has a unique hook, it’s much easier to sell. You go to Paris expecting a cosmopolitan city experience, complete with bistros, museums and the Eiffel Tower. You go to Kenya on safari, expecting to see incredible wildlife in their natural habitat. You go to the Maldives and expect silver sands and turquoise seas. It’s what you’re paying for, and the tourism operators will fall over themselves to make sure you get it. Scotland is no different. A nation sculpted into an ideal tourism destination over the years, beginning with the systematic evacuation of its people from its most fertile places, through its Walter Scott and misty glens-driven romanticisation, and finally to its destination as a well-oiled machine of hideaway cottages, whisky trails, and furry Highland Coo hats. The image Scottish tourism wishes to project is one of untamed wilderness; a place to ‘get back to nature’, with nature here specifically referring to one free of humans. How else could the rich tapestry of wildlife have developed if it were not for the empty glen, the echoing forest, or the lonely moor? It is an image that the landowners of Scotland’s huge estates are keen to promote, particularly as they shed the skin of their tainted history and don the shining armour of environmental stewardship. Scotland’s cultural past is all about re-shaping history, painting it in a positive gloss, and packaging it into a tartan box to be sold on to tourists. You can find the usual narrative of bloodless battlefields and spiralling castles on any bog-standard coach tour leaving from the Royal Mile, but to find a specific tourist experience means going further afield. If you want your Celtic religion, you head to Iona. If you want your whisky expertise, go to Islay. The islands are ripe for having a knock-out punch to their tourism appeal, as they are already conveniently packaged by the Atlantic Ocean. However, having the sea there brings with it the difficulty of access; you can do a sweep of the main Scottish sites within a day from Edinburgh, but to see what the islands have to offer, you have to really commit. This doesn’t mean that the island communities themselves are falling over each other to offer the greatest beaches, the cleanest lochs or the most abundant wildlife, but it does help the Scottish tourist board to sell each island as unique. The ferry waiting rooms are full of brochures and posters for the isles, each one promising a different experience. I’ve been to a fair few islands myself, and know that if I go to Coll, I should expect to see basking sharks; and if I go to Harris, unspoilt beaches litter every corner. But there’s one island in particular that offers that sought after bespoke reward of attendance due to its extreme inaccessibility – so inaccessible that it has morphed into legend. I’m talking, of course, about the archipelago of St Kilda. I am writing this having just returned from a trip out to St Kilda, and I feel an immense amount of privilege at having seen a place that many can only dream of. It really is a site of immense beauty and awe, with monolithic cliff faces rising out of the turquoise sea like leviathans of old, as gannets and puffins wheel screeching above. However, its extreme remoteness has bred a certain narrative, passed on by people who, fascinated that life could exist here, came to gawp at the natives in their natural habitat and then returned to their metropolises abound with tales of evolved feet and self-sufficiency. Over 700 books have been written on St Kilda, and the vast majority of them paint a picture of hardy, self-sustaining people, skulking in their blackhouses and scaling cliff faces to gather seabirds and eggs to feed themselves. There was no money or outside influence for centuries, until this unique community collapsed in on itself under the weight of modernisation, war and disease. In actual fact, St Kilda wasn’t a particularly unique society; they paid their rent to a landowner just like any other island community; and far from being subsistence hunter-gatherers, they managed a healthy trade in fulmar oil and feathers, alongside farming the abundant fertile land around the village. But search the popular literature and try and find a history that states this (hint: you won’t). As the only UNESCO world cultural and natural heritage site in the UK, the island is bound to attract tourists searching for a particular experience, or often just something to tick off their bucket list, but the perpetuation of the myth of St Kilda reveals some deeply ingrained issues within Scottish tourism as a whole. The whole story of a particular site is often not told, and, in the case of St Kilda especially, out-and-out lies are spread to preserve the story. Perhaps the most pervasive narrative promoted by the Scottish tourist board is that the wild and beautiful landscape is a natural feature of the Highlands; something that has remained unspoilt and unchanged – save for a few castles – for centuries. Anybody who has even the slightest knowledge of Scottish history will know this to be untrue – that the empty Highland glen is as man-made as the tenements of Glasgow. As greedy landowners and cash-strapped chieftains seized the opportunity to become richer and more powerful, the hills were flooded with sheep. The smallholdings farms tended by the gaels were ‘cleared’ to the margins of the – usually agriculturally inferior – land, where they were left to eke out a meagre existence from crofting. These crofts were intentionally made too small for subsistence, so the tenant remained beholden to the landowner for work. It was a brutal and often bloody period of Scottish history, and the scars of the clearances remain etched into the land and in the memories of the people who still live there. Yet open a guide book on Scotland and see what you find. Like St Kilda, the narrative has been squashed into a cursory few sentences (if that), in favour of the gift-shop ready postcard vistas favoured by Victorian Celtic-twilight devotees. For example, the isle of Skye was the site of some of the most violent clearances undertaken by Lord Macdonald, yet his castle home is now a museum, restaurant and wedding venue that promises ‘an outstanding holiday experience’. It is the formation of this experience that does Scottish tourism a disservice. By providing a handy checklist for tourists to tick off as they go, swallowing carefully selected morsels of culture to add to their scrapbooks, you deny them a chance to really get to know the landscape and the history. By reducing the islands to mythical tales shrouded in mist in order to sell artisan goods made by real islanders, you deny the locals their own individual voices. By assigning the land a special ‘wild quality’ to thwart development, you erase hundreds of years of stewardship by humans whose brutal eviction from their homes must be remembered. By ascribing to the view that Scotland’s touristic appeal can only be managed by owners of huge, empty estates, you impede the progress of land reform. By breaking down Scottishness into a whirl of tartan, bagpipes and quaint Scots phrases, you lose the chance to celebrate the individuality of its people. 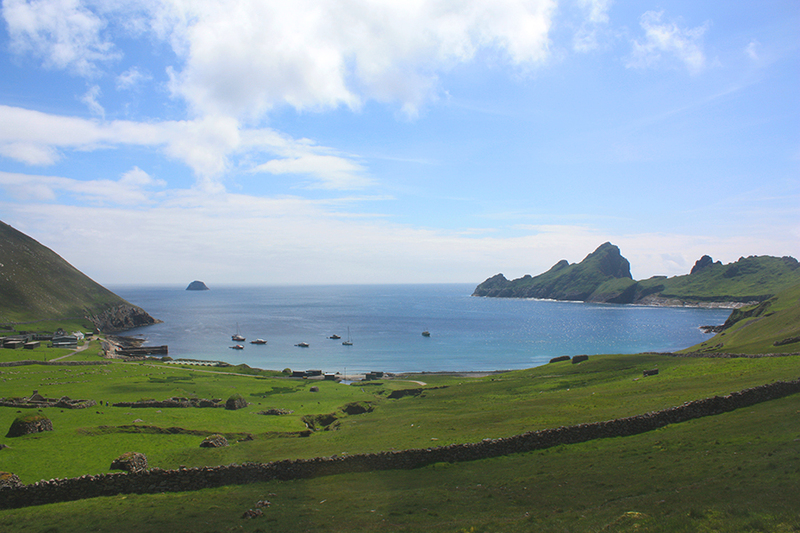 The story of St Kilda is a neat encapsulation of the state of Scottish tourism today. It is Scotland’s most marginalised communities – the islands – where tourism is relied on most, yet it is also these communities who suffer the most from emigration of young people to the mainland, lack of development and jobs, absentee landlords, fuel poverty and depression. The simplification of island life in order to promote a certain experience based on remoteness or wilderness merely further damages the community in the long run, and prevents islanders from gaining true autonomy. They are real, working places and should be viewed as such. Scotland is a dynamic, fascinating country; all the way from its affluent border towns, right up to the remote sea stacks of Shetland, and it deserves to be seen by tourists. However, to truly get to know Scotland as a country, the whole story needs to be told. 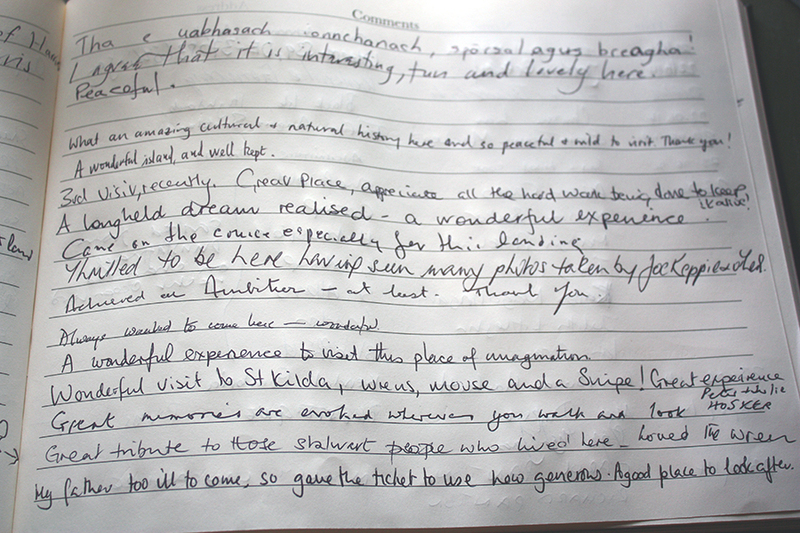 So what are the out and out lies spread about St Kilda? These are the ‘facts’ that bring tourists flocking to the st kilda today and because of this, the national trust for scotland/SNH are required to offer a tourist experience that fits this vision. Speaking to an archaeologist on the site, he expressed his frustration at how little he was allowed to excavate or even repair since the UNESCO award was granted, but up until that point, basically anything went. Houses were fitted with electricity, doors were ripped out and replaced and all sorts of things moved around – the fact that St kilda is being touted as a perfectly preserved 1930s landscape is a total falsehood, and yet work parties turn up every year to help preserve these 1980s fixtures for a (mostly) unsuspecting public. As well as this, I have seen several tourist pamphlets where the military base has been photoshopped out – very little of st kilda’s military history is ever mentioned in the history books, when in actual fact it is a huge part of the island – several tourists on the day I was there remarked that they didn’t expect to see military buildings and equipment, but it is considered an eyesore (and obviously not from the 1930s) and something tourist operators are keen to play down.